Are you a quilter? Or have you always wanted to give it a try? Join Sarah Bond at Mt. Airy Art Garage for a MAAG Quiltapalooza. Come on over and start a string quilt. This simple and quick method builds quilt squares on a muslin foundation using the scraps or “strings” left over from cutting fabrics for other quilts. Sew, uninterrupted, for a few minutes or the whole evening. No interruptions nobody else’s mess to clean up! 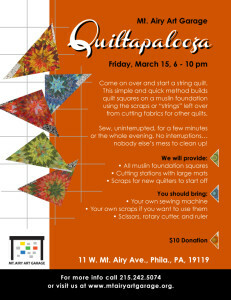 http://mtairyartgarage.org/wp-content/uploads/2013/03/Quiltapalooza-flyer.jpg 792 612 Arleen http://mtairyartgarage.org/wp-content/uploads/2016/06/maag-in-action_main-1024x274.png Arleen2013-03-13 15:27:112019-01-30 15:04:06String Quiltapalooza's Back! 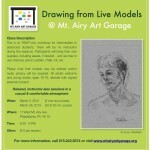 Live Model Drawing Wow! 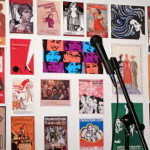 International Women’s Day – Where Do We Even Begin?